The Best Ever Bridgestone B330 Ball Fitting? What is the purpose of custom fitting? To fit players with the best equipment, optimised specifically for their game, with the goal of producing the best level of golf possible. Right? Well the folks at Bridgestone Golf may have already claimed the best fitting story of 2014. 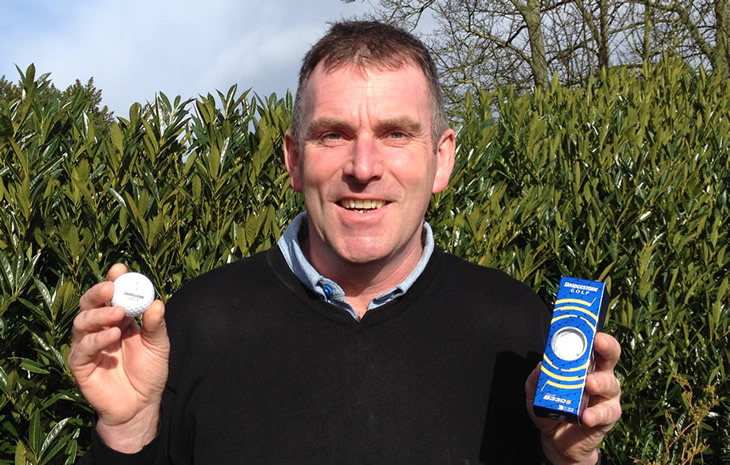 David Donnelly, a six-handicapper, attended a Bridgestone Ball Fitting on the way to the first tee of his home course at Ashhbourne Golf Club. Within an hour, Donnelly had made a hole-in-one. Bridgestone conduct more than 250,000 of these fittings across the world each year. And it seems, for David Donnelly at least, it was right place at the right time. David was one of 16 players at Ashbourne that went through the fitting process. His results showed that his swing was suited to the new Bridgestone B330-S ball, the same ball used by PGA Tour player Matt Kuchar. He put the new ball into play immediately after the fitting and just 50 minutes later arrived at the 162-yard par-3 5th hole. Facing a stiff breeze, Donnelly chose a 5-iron and tried to steer his shot towards the hole. It landed dead on line, headed for the flag, and the rest is history. I’m delighted with the hole-in-one and extremely glad I made the ball change prior to the competition. This is the first time I’ve been measured for a golf ball that suits my game and it’s safe to say the new one made a big difference on the day! To see a list of Bridgestone ball fitting dates and find a session near you, visit our exclusive Bridgestone Zone.